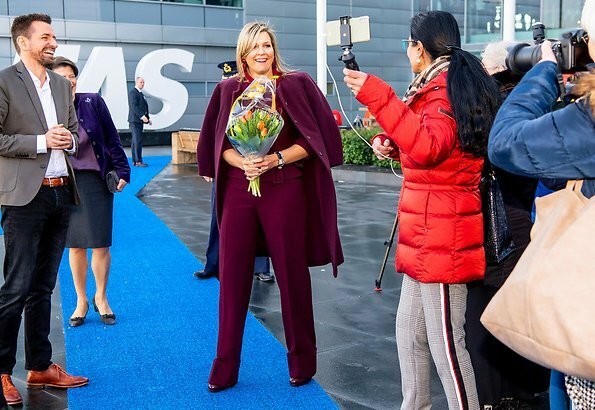 On January 29, 2019, Queen Maxima of The Netherlands visited AFAS Software in Leusden, The Netherlands. 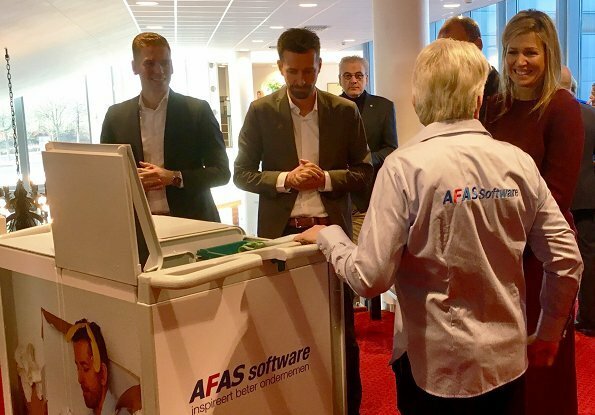 AFAS Software is the winner of King Willem I Award in large company category. Since 1996, AFAS supports large and small companies and organizations in automation process, with a single standard (online) software application. For example, datas of financial management, payroll management and project management have been fixed on the same database. 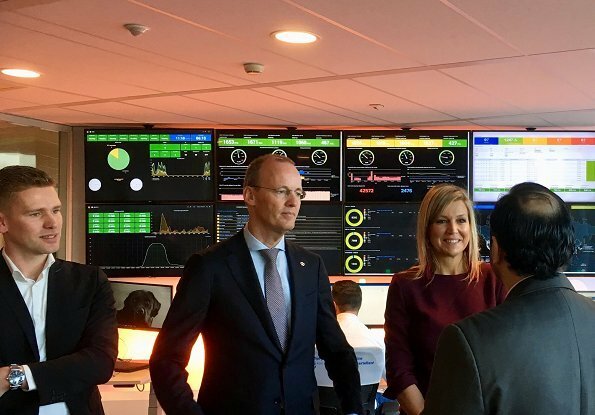 On January 29, 2019, Queen Maxima attended "Cultural diversity at the top" meeting held at the Social Economic Council (Sociaal-Economische Raad - SER) in The Hague. Managers, role models and experts discussed during the meeting how to increase diversity in cultural backgrounds at management and board level. Love the shorter length hairstyle! The Queen looks great! Oh, I adore this outfit. Fantastic colour, flattering silhouette. The trousers and shoes have a slight retro vibe, but subtly so, looking interesting instead of dated and are a refreshing relief from the ongoing skinny trend. Earrings are great too. Her hair is usual mess, unfortunately. Agree with you, Vanessa. The cuffs on the trousers spoil them for me, but still an overall great look. Maxima clearly looks better in simple clothes. The monochromatic look here suits her. Maxima's burgundy outfit is beautiful on her. I would have liked to see how the coat looks on her arms because the sleeves are interesting, especially. I do not care for those pants with the huge cuffs she has been wearing and I hope that they don't show up as a choice for everybody. The earrings are intriguing. Are they tassels? I don´t care for the cuffs on the trousers either, but I do love the length and width! Such a gorgeous color, and well-tailored -- but with everything done in the same saturated hue, it's a little too matchy-matchy even for me. I'd have liked to see a little bit of variation, such as a herringbone weave in the coat or a subtle pattern in the top. Queen Maxima is looking good, like her hair today and the liclac ensemble. She wears the coat over her shoulders, not shure about that, because the shoulders get too big. If the pants were without wide cuffs she would look great.Such a cuffs makes the person look very heavy. Gorgeous lady lovely outfit, she looks amazing! So up to date and modern.